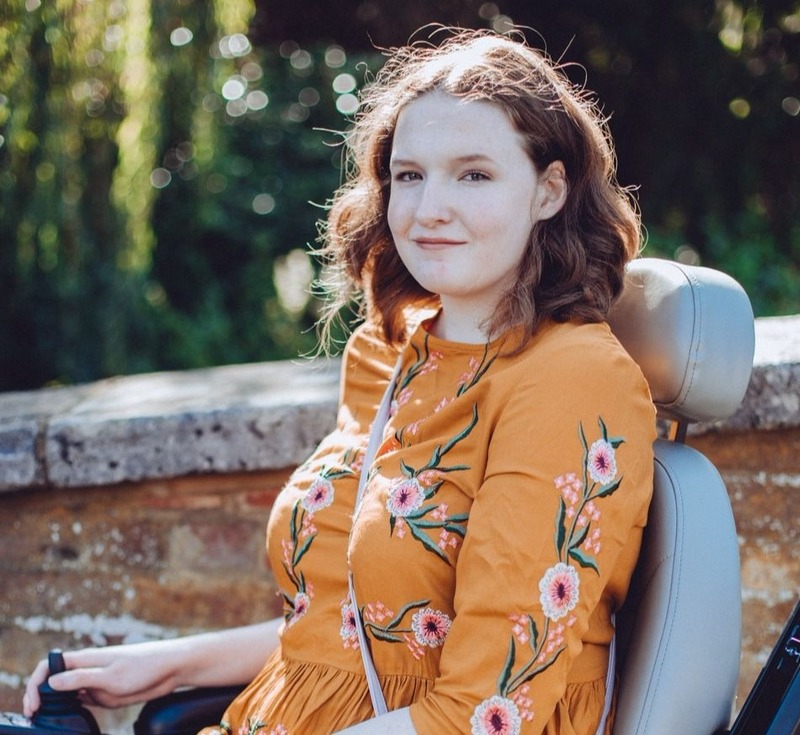 At the end of August I was contacted by a lovely brand that I hadn't heard of before and I was lucky enough to be able to try out some of their products over these past couple of months. Benecos are an award winning, certified natural makeup and skincare brand that was created by 2 German founders. They wanted to develop a high quality, yet reasonably priced, natural makeup, skincare and nail polish brand that would attract a younger audience and hopefully introduce them to the benefits of natural cosmetics. 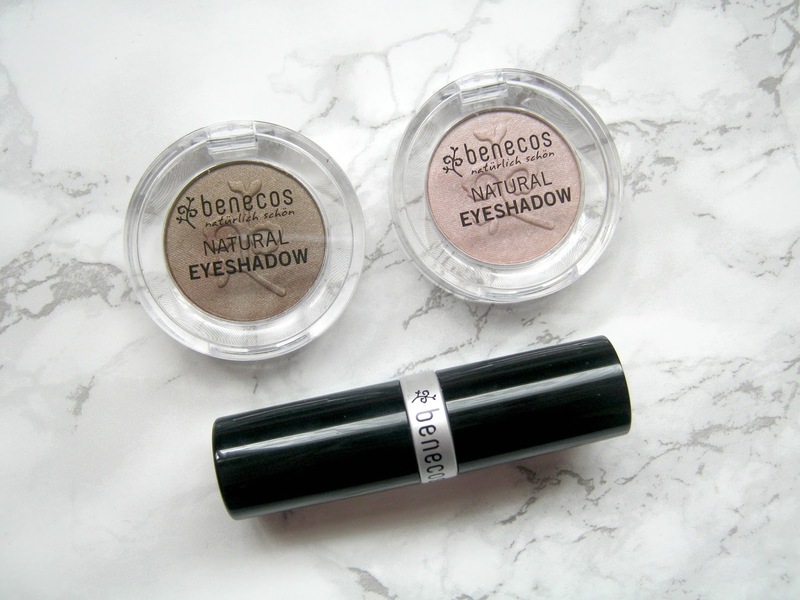 I must admit that I haven't really researched much about natural products or purposely gone looking for them but I do follow a few cruelty free blogs who have a big focus on natural products and it definitely makes me want to try more brands like Benecos out. The packaging of these 2 eyeshadows are pretty simple but I really love that they aren't too fancy, they definitely fit the market that this brand is aiming at. They are both part of the new range that has been released for Autumn and they are definitely 2 shades that I would pick for this time of year. The brown shade is one that I've been finding myself go back to a lot, it's great for blending through your crease and darkening up your eye look a little for these colder days. Whilst the lighter shade makes for the perfect base and inner corner highlight, I also use it on days when I'm not wearing much makeup though as it just brightens up my eyes a little. 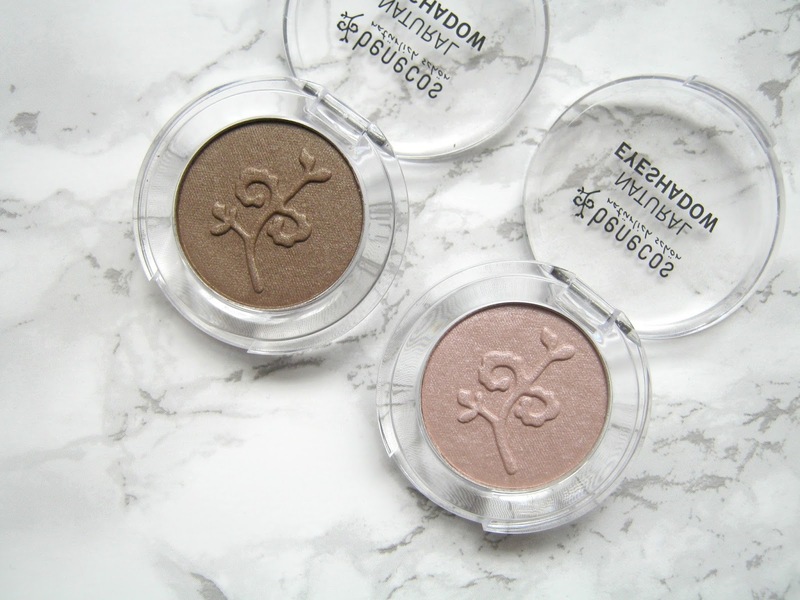 Both eyeshadows are very nicely pigmented (swatches below) and they are also soft enough to be easily blendable but at the same time they aren't so soft that you get fall out either. The perfect balance! 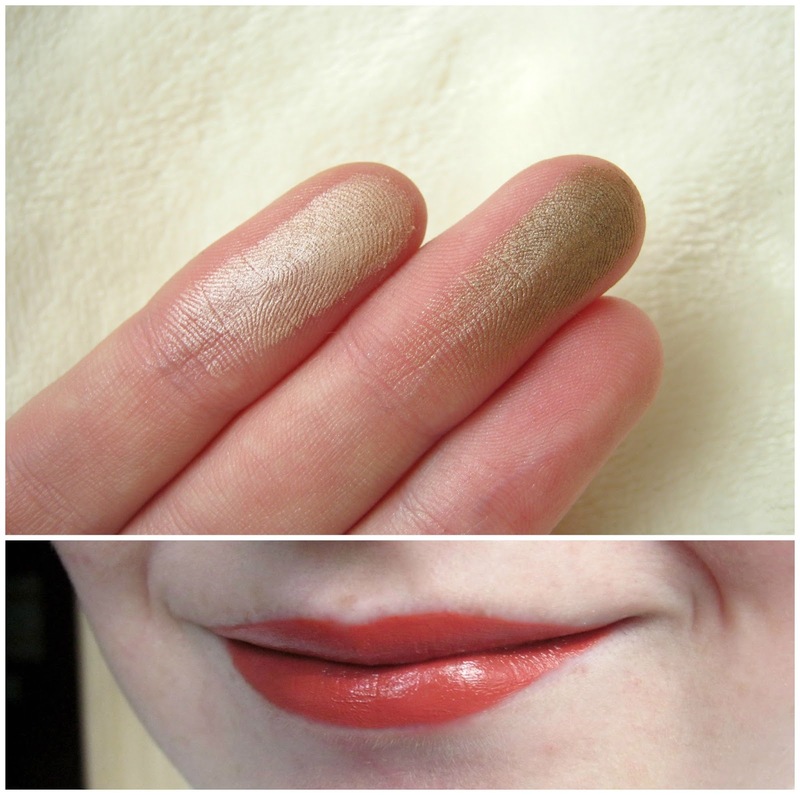 If you read my blog often then you'll know that I've always favoured more toned down pinks over bright red lipsticks but the first time I put this on I knew that I would get on with it. 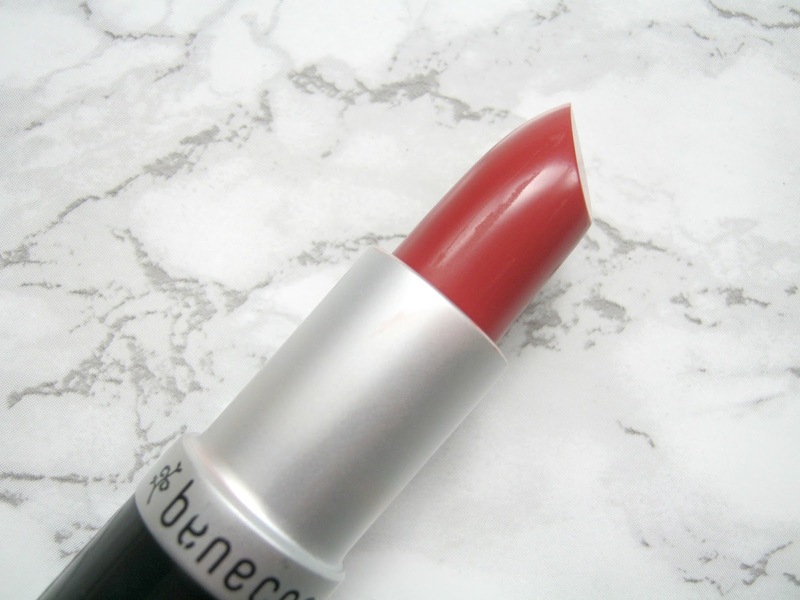 It's the perfect brick red shade and I think it compliments my ginger hair really well, I've loved it more than any other red lip product I've tried before. When I first applied it I found that it didn't feel very smooth straight away but as it settled it felt really soft and moisturising and yet it stayed on for a good 3/4 hours before I had to reapply! I think I'm going to be wearing this a lot throughout Autumn and Winter! You can buy Benecos products from Whole Foods or online here. These products were sent to me for review consideration but this does not affect my opinion and I am always 100% honest.